Eww… Forgive me, Jesus, but that is kind of disturbing. “How can this man give us [his] flesh to eat?” [John 6:52] No matter how Jesus’ words are re-framed or explained in the context of God’s gift of manna from heaven to the Israelites, and God’s gift of Jesus as the bread from heaven to the world, many of us are still left with the feeling we don’t get it. Unlike simple (and unsatisfactory) examples of 4-leaf clovers, pretzels, and trefoils employed by some to explain the Trinitarian doctrine of three persons in one God, this third part of Jesus’ bread of life discourse defies imagery and abstract language. Still, in order for us to advance in our understanding we really need to stop being so literal and focus on what Jesus is saying about how eating the bread of life will transform us. Jesus utilized the food analogy for spiritual purposes. Recall that analogies compare one thing to another in a way that is “like” but “not like” the reality being described. Analogies are never intended to be literal. Phew! Thank you, Jesus! The key here is to identify the traits of the one thing that hold true (food and drink satisfy physical hunger) in the context of the teaching (unlike manna from heaven which temporarily relieved physical hunger, Jesus is the bread from heaven who satisfies spiritual hunger for all of eternity). Food and drink have the power to transform us from within. To that end, two foodie films came to mind as I prepared this reflection. One is King Corn, a documentary exposing America’s corn-based food supply. The film is described as “a humorous and touching documentary about two best friends who decide to move to Iowa to grow an acre of corn after finding out through laboratory hair analysis that their bodies are primarily made out of corn.” If you doubt this is true, please search for and watch this movie, and get back to me. http://www.kingcorn.net/the-film/synopsis/. What we put in our bodies, be it food, drink, or outside influences including opinions, art or media really, truly does impact the health of our mind, body and soul [Eph 5:15-20]. The second film, and one I have seen many times, is Babette’s Feast, a culinary drama set in 19th century Denmark in which a renowned Parisian chef takes refuge as a housekeeper/cook for two aging spinsters. 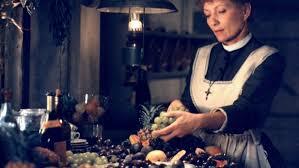 Much like Wisdom dressing her meat and mixing her wine [Prv 9:1-6], Babette spreads a table for the townsfolk. Each time I see this film, with its emphasis on the preparation of a final meal and the eventual transformation of the characters from a kind of death to life, I note deeper themes of Eucharist: service, sacrifice, forgiveness and reconciliation. You will want to experience some authentic French cuisine with friends after watching this film. http://www.imdb.com/title/tt0092603/. © 1987 Metro-Goldwyn-Mayer Studios Inc. All Rights Reserved. It has been said that the church was born around the table. It has also been mentioned that the prominence of meal sharing in Jesus’ ministry points to the humorous conclusion that Jesus ate his way through the gospels. But as the bread of life discourse reveals, the real meal is Jesus’ ongoing and unconditional sharing of self. Jesus’ flesh and blood represent his life; Jesus’ life discloses his consciousness of being one with God. His flesh and blood refer to his earthly ministry and willing sacrifice, his union with God, and what he continues to do through his church, the body of the living Christ [1 Cor 12:27]. This consciousness of Jesus, this oneness with God, and mission to reunite God and creation is the “this” which Jesus at the last supper refers to when he says “do this.” It is the meal, the mission, the union: all of it. The whole loaf. The doctrine of real presence is more readily consumed with this understanding. Christ is truly present. When we receive Eucharist, we give our fiat, we say “yes, please” to taking Jesus’ consciousness and all that it entails into our bodies. In this way, we become the host. Imagine the transformation of Christ’s church today if every person stepping forward to take communion was attentive to this point. We have many ways to be aware of God: in nature, in human relationships, in worship, and in prayer, just to name a few. But Eucharist is different. It is the one act in which we physically eat what we profess to believe. The communal act of receiving Eucharist runs the risk of becoming a meaningless ritual, a symbolic reenactment that tells us the mass is almost over. But when it is properly understood as taking in Christ’s consciousness it is impossible to remain unchanged, and even more impossible to deny the requirements of discipleship.